As a critical element of the Marine's individual load, the ILBE pouches provides a stable platform for the carriage of equipment and supplies needed across the spectrum of individual and unit operations. The ILBE pouches are a series of robust, specialized pouches capable of carrying the basic ammunition load required to support and sustain the individual Marine during combat operations. Designed for modularity and accessibility, this pouch holds one 9mm magazine. Designed to be sleek and accessible, this specialized pouch holds the Marine rifleman's first choice M16/M4 magazine. Designed to be the sustainment pouch for the M16/M4 Speed Reload pouch, this pouch holds up to two M16/M4 Magazines and is single magazine wide. Designed for accessibility and modularity, this pouch holds one 40mm grenade (all DODICs). Designed with unit leader in mind, this pouch affords the user quick access to one pop-up flare. Designed to hold one M67 grenade, this pouch affords the user quick access and modularity. Designed to be a multifunctional pouch, this pouch holds one 200 round SAW drum or six 40 mm grenades or six M16/M4 Magazines securely. Designed to hold ten 3 inch 12 gauge shotgun shells, this pouch affords the user the ability to breech three doors. Designed to be a multifunctional single grenade pouch, this pouch holds one Smoke grenade, Thermite grenade, Star Cluster grenade or two Flashbang grenades. 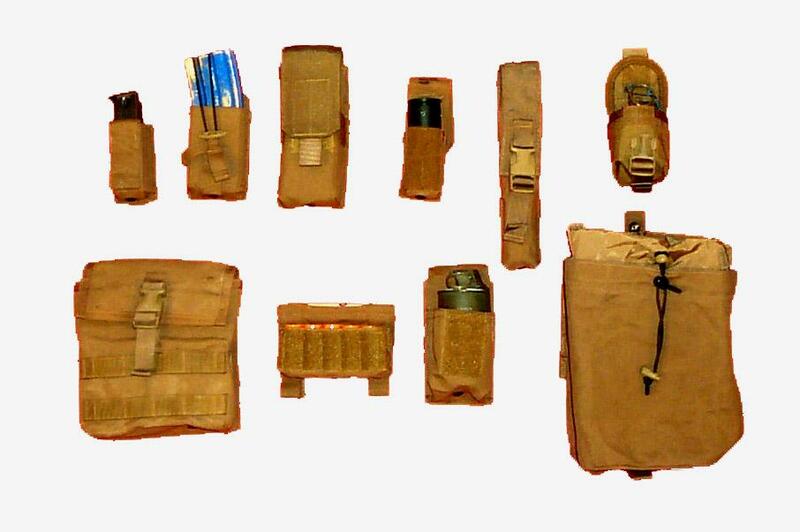 Designed to hold seven expended magazines, this pouch can be stowed out of the way during administrative operations.